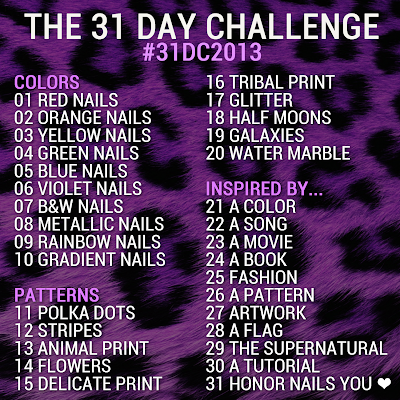 I'm participating in another 31 day Challenge, this one was started by Chalkboard Nails and I think this is the third year she is doing this, gotta love her dedication!! So here are my red nails. I'm not absolutely in love with this one, there is something I'm not liking but can't put my finger on what it is, a friend asked me to do her nails for a wedding she is attending and this is one of my test manis, I'm going to keep the colors but change the nail art a little when I do her nails. I think they look so pretty!